Western blot analysis of extracts from human Jurkat cells (lane1), rat brain (lane 2) and mouse brain (lane 3), using CaMKIV Antibody. 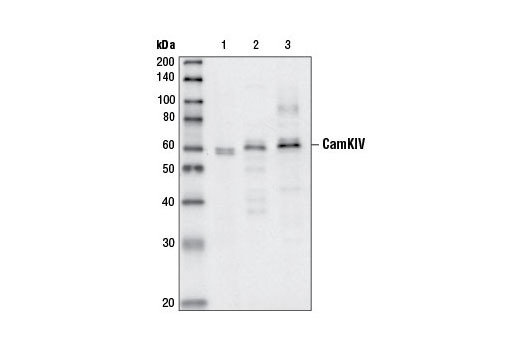 CaMKIV Antibody detects total levels of endogenous CaMKIV. Polyclonal antibodies are produced by immunizing animals with a synthetic peptide around amino acid 282-300 of human CaMKIV. Antibodies are purified by protein A and peptide affinity chromatography. CaMKIV is an important member of calcium/calmodulin-activated kinases. CaMKIV signaling has been related to long-term neural potentiation and memory (1,2), as well as T-cell receptor signaling (3). CaMKIV has catalytic and regulatory domains. The Ca2+/calmodulin-dependent CaMKK phosphorylates CaMKIV, releasing the autoinhibitory effect and thus activating the kinase (4-6). The activated CaMKIV further autophosphorylates itself at Thr196 (or Thr200 in human) to render the kinase constitutively active (5). The threonine phosphorylation state of CaMKIV can be downregulated by PP2A dephosphorylation. Kang, H. et al. (2001) Cell 106, 771-783. Kasahara, J. et al. (2001) J. Biol. Chem. 276, 24044-24050. Yu, C.T. et al. (2001) J. Immunol. 166, 284-292. Chatila, T. et al. (1996) J. Biol. Chem. 271, 21542-21548. Means, A.R. (2000) Mol. Endocrinol. 14, 4-13.